The Ningqiang meteorite fell in a field in Ningqiang County, Shaanxi Province, China on 25 June 1983. Four pieces of a single stone with a mass of 4.6 kg were recovered. The meterorite’s fall was announced in Meteorite Bulletin 65 (1987). 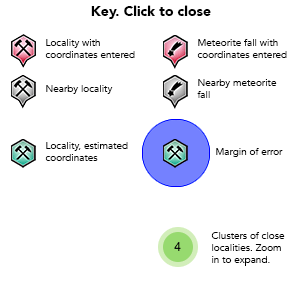 The meterorite’s classification as a carbonaceous chondrite is straightforward as over 90% of the meteorite is a roughly half-half mixture of matrix and chondrules. However, its specific classification has been quite problematic as it also contains a variety of small inclusions and aggregates with disparate specific affinites with CV, CK, and CM Carbonaceous Chondrites. With access to considerably more material than previous investigators, Wang and Hsu (2009) established that Ningqiang does not belong to any of the eight chemically defined groups of Carbonaceous Chondrites. They also investigated several hundred refractory inclusions and ‘amoeboid olivine aggregates’. These varied and incompletely equilibrated inclusions and aggregates help to explain much of this meteorite's mineralogical ‘plenitude’. Reference: Wang, Y. & Hsu, W. (2009). Petrology and Mineralogy of the Ningqiang carbonaceous chondrite. Meteoritics & Planetary Science Vol. 44, #5, 763-780. (May 2009). Reference: Lin, Y. T. & Kimura, M. (1996). Discovery of Complex Titanium Oxide Associations in a Plagioclase-Olivine Inclusion (POI) in the Ningqiang Carbonaceous Chondrite. Lunar and Planetary Science, vol. 27, pages 755-756. (1996). Reference: Xiyue Wang, Huimin Zhang, Sichao Wang, and Yuezhen Wu (1987): Acta Petrologica et Mineralogica 6(4), 296-306; Xin, H., Eisenhour, D.D., and Buseck, P.R. (1995): Meteoritics 30(1), 106-109. Reference: Rubin, A. E., Wang, D., Kallemeyn, G. W. & Wasson, J. T. (1988). The Ningqiang meteorite: Classification and petrology of an anomalous CV chondrite. Meteoritics 23, #1, 13–23. (March 1988). Reference: M. Sugita and K. Tomeoka (2009) JAKOKA: 2009 Annual Meeting of the Japan Association of Mineralogical Sciences, R9-10. Reference: Plagge, M., Ott, U., and Hoppe, P. (2006): Presented at the 37th Lunar and Planetary Science Meeting, March 13-17, 2006. Reference: Xin, H., Eisenhour, D.D., and Buseck, P.R. (1995): Meteoritics 30(1), 106-109. Xiyue Wang, Huimin Zhang, Sichao Wang, and Yuezhen Wu (1987): Study on mineralogical and petrographic characteristics of carbonaceous chondrite in the Ningqiang area. Acta Petrologica et Mineralogica 6(4), 296-306 (in Chinese with English abstract). Rubin, A. E., Wang, D., Kallemeyn, G. W. & Wasson, J. T. (1988). The Ningqiang meteorite: Classification and petrology of an anomalous CV chondrite. Meteoritics 23(1), 13–23. Xin, H., Eisenhour, D.D., and Buseck, P.R. (1995): Cobalt-rich, nickel-poor metal (wairauite) in the Ningqiang carbonaceous chondrite. Meteoritics 30(1), 106-109. Guimon, R.K., Symes, S.J.K., Sears, D.W.G., and Benoit, P.H. (1995): Chemical and physical studies of type 3 chondrites XII: The metamorphic history of CV chondrites and their components. Meteoritics 30(6), 704-714. Lin, Y. T., and Kimura, M. (1996): Discovery of Complex Titanium Oxide Associations in a Plagioclase-Olivine Inclusion (POI) in the Ningqiang Carbonaceous Chondrite. Lunar and Planetary Science 27, 755-756. Zolensky, M., Nakamura, K., Weisberg, M.K., Prinz, M., Nakamura, T., Ohsumi, K., Saitow, A., Mukai, M., and Gounelle, M. (2003): A primitive dark inclusion with radiation-damaged silicates in the Ninqiang carbonaceous chondrite. Meteoritics & Planetary Science 38, 305-322. Plagge, M., Ott, U., and Hoppe, P. (2006): Search for extinct chlorine-36 in an Allende CAI. Presented at the 37th Lunar and Planetary Science Meeting, March 13-17, 2006. Sugita, M. and K. Tomeoka (2009): JAKOKA: 2009 Annual Meeting of the Japan Association of Mineralogical Sciences, R9-10. Wang, Y., and Hsu, W. (2009): Petrology and Mineralogy of the Ningqiang carbonaceous chondrite. Meteoritics & Planetary Science: 44(5), 763-780.